Cornish chickens are the cornerstone of our broiler industry today and requires a heavy feeding regimen. Size: Standard Male: 10.5 Ibs. / Standard Female: 8 Ibs. / Bantam Male: 44 oz. / Bantam Female: 36 oz. Comb, Wattles & Earlobes: They have a small pea comb, wattles, and ears with all being bright red. Color: The beak is yellow and the eyes are pearl with the shanks and toes being yellow. Blue-Laced Red: Most of their feathers are red or either tipped and laced with blue. Male: The tail feathers are blue with red shafts and center. Columbian: They have standard Columbian plumage. Dark: They have standard dark plumage. Jubilee: Male: The head,neck, saddle, breast, body, legs, and tail are white. The back and wings are white highlighted with a rich red. Female: The head and neck are white and the rest of the body is red with white lacing or double lacing. Silver Laced: Standard silver laced plumage. White-Laced Red: Male: They have primarily rich red feathering laced in white. The main tail feathers are white. Female: The primarily rich red feathering is laced in white. Special Qualities: This breed produces great broilers and is the principal bird used in the commercial industry. The foundation for our commercial broiler industry, this breed is a muscular, strong looking bird. It was developed in Cornwall, England and has a strong game bird heritage. 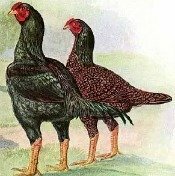 The Aseel provided the foundation bloodlines for this breed, but other game birds made contributions, such as the Old English Games and the Malays. One unique characteristic of the breed is that the males and females have almost the same build, which includes a wide and deep breast and large and wide set legs. Cornish Chickens do not fare so well in free range situations because they cannot seem to get enough food. They are very heavy eaters and must be given enough feed to produce. They are hardy and fairly docile for a bird that has a game heritage. The hens tend to go broody and are very protective mothers. The roosters are sometimes incapable of natural breeding because of their large breasts and short legs. This breed was first recognized by the APA in 1893.